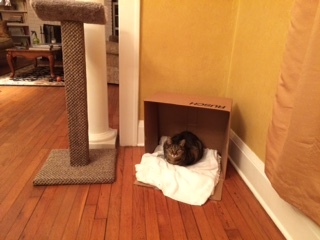 Hannah in a box, added as a cozy hiding place. 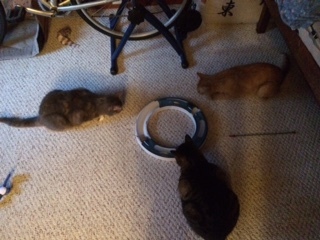 All three cats being hospitable together! Enjoying the scoop post from FF! I was at my wits end when I was given contact information for Ingrid Johnson. I have had cats all of my life and consider myself pretty knowledgeable about cats. 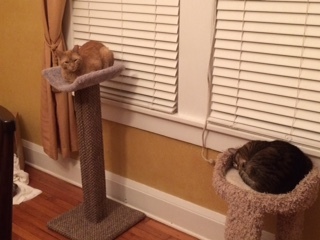 I had never had any what people would call “problem cats” before; I had cats that took some time to adjust to each other, but with time they did. My family is made up of a 10 year old female cat, 9 year old female cat and 4 year old male cat. My 10 and 9 year old have been with each other most of their lives and though they were not as close as they used to be, they got along. The problem started when I rescued my boy cat when he was 4 weeks old. My oldest one never adjusted to him and since he was young and energetic, he wanted someone to play with. My girls just did not want to have anything to do with him. About 2 years after he had been with us, the peeing started! I had a few accidents prior to him, but nothing as regular as I was having. I tried everything that everyone told me to do and thought about an animal behaviorist, but thinking it was too expensive, I just kept doing the same stuff. Finally, about 4-5 months ago I was just so extremely frustrated with the peeing and marking all over the house. I volunteer at an animal shelter and one of the employees was telling me about Ingrid. I decided to get on line and see what she was all about. The first time I was online on her site, I was so impressed with what I was reading, I filled out the consultation form that night. I put in to place some of the suggestions she made the next day. Ingrid got back with me right away and together we came up with a plan to see the vet she works with at Paws Whiskers and Claws just to make sure there were no medical issues. That meant putting off a visit, but it just made more sense this way; I was impressed that she was looking at the whole picture. I was thoroughly impressed with my whole vet experience and within the week of my vet visit, Ingrid came to my house. She took the time to listen, to look, to interact, and to just be with my little ones and me. She stayed way longer than what she had stated and I never felt like she was rushing to get done with us. She brought samples of interactive toys, food, and foraging toys (for dry food), and a WHOLE BUNCH of knowledge! We immediately put in to place some changes and I immediately saw some changes. We ended up having to put my boy on some calming medication after several follow up discussions and though we did not originally want to go that route, it ended up working best for all. Ingrid checked in with me on a regular basis and always made me feel welcome to get in touch with her. Those follow up contacts made a huge difference. I ended up buying some of the things she brought, but I also had a budget and she never pushed me beyond my budget. It has been 4 months now and our lives are so much better. There have been a handful of accidents over that time period, but as Ingrid told me from the beginning, we were not looking for perfect! It is soooooo much better and I didn’t need perfection; I just wanted better. I play with my little ones differently; how I feed them is more appropriate and what I feed them is definitely more appropriate. We are a much calmer and happier family. My oldest and youngest still don’t like each other all that well, but they at least tolerate each other better. I still pick Ingrid’s brain and appreciate her willingness to hang in there with me. I was not able to do everything she recommended, but I slowly changed things, added things, and adapted what we were doing. I am more than happy to speak with anyone who is considering consulting with Ingrid. I will say this….you have to be willing to follow through. It is like taking piano lessons. If you only play when you have a lesson, nothing will change. If you put the time in to practice, you will see tons of progress. After a while, it doesn’t feel like practice anymore and it is just fun times with your little ones! I thank Ingrid and Miloch, Hannah and Adin thank Ingrid! We all love the changes that have been made and we are all living better because of it! 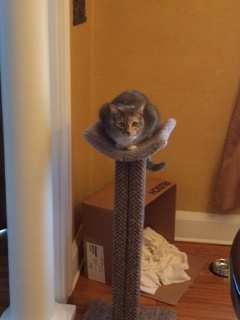 Hannah atop her new scoop post from FF! 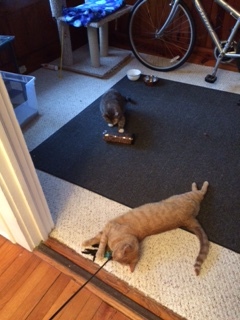 Previous enemies, foraging and playing together. 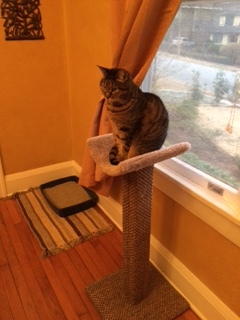 Miloch enjoying her new scooped scratching post.